This system provides a robust and repeatable Picatinny rail, while maintaining the benefits of a slim and lightweight M-LOK system. These fully skeletonized hand guards provide a rock solid attachment point for all of your Picatinny and/or M-LOK accessories. 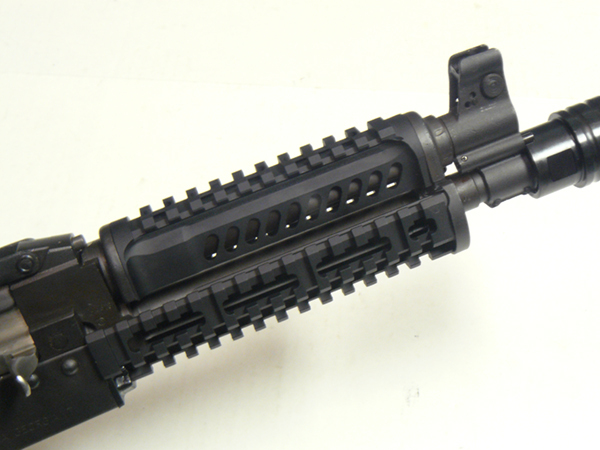 The most narrow and lightest Picatinny rail handguard on the market by a wide margin. At only 1.635" inches wide, they are quite comfortable to hold with none of the excess bulk typically associated with Picatinny rail handguards. Mounts Picatinny accessories closer to the bore than any other handguard, for more weapon stability, and a smaller complete weapon package. Fully M-LOK compatible, with no wasted space, for maximum versatility. Comparable size, but lighter than most M-LOK only systems. With the added bonus of accepting Picatinny rail mount accessories directly. This skeletonized rail design provides increased surface area compared to standard smooth M-LOK or Keymod handguards, promoting optimal heat dissipation. Precision machined high grade aluminum, shot peened, and finished in durable black hardcoat. These rails are built to withstand the most adverse situations. They are available now for most AK variants including AK47, AK74, M92/M85, M70, Vepr rifle, Saiga rifle. Many other variants are coming over the next couple months including Tantal, VZ58, AR15, PSL.